There’s always going to be someone that has something that you don’t – why not work with them? By collaborating on projects, businesses in the fashion and textile industries can further their customer reach, save money and create something magical by utilizing the skills of other professionals. Perino by Woolyarns has collaborated with a number of designers and brands, learning the value of sharing resources and ideas. Working with industry professionals from a different discipline to your own can be a really effective way to broaden skills and at the same time make a new product. Many brands embrace collaborations with guest designers to create mini collections to be sold alongside their regular offering. This enables the buzz of the project to be built up and marketed to both the brand and their guest designer’s followers, overlapping their reach and all the while promoting an innovative new idea. Collective studio spaces, shared offices and businesses like Australia’s Collabosaurus, help participants to be collaborative in their work. 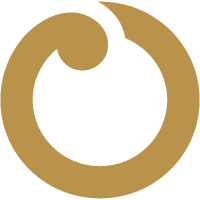 Collabosaurus is essentially a match making service that businesses can sign up for, enabling networking between groups seeking to make innovative solutions. It encourages strategic partnerships that enable all businesses involved to create a buzz around their individual brand and reach a wider audience together. In an age of social media and content sharing, it is only natural that this crosses over into skill sharing between businesses, brands and designers. With the increasing number of consumers on social media platforms, the fashion industry is more accessible than ever, and similarly it’s easier than ever for brands to get to know their customer. Some major fashion brands are even tapping into this by collaborating with everyday people that have a large following on social media. Brooklyn Beckham and Kendall Jenner aren’t exactly the “everyday person” but their huge social media followings have secured them opportunities with major luxury brands due to their reach with consumers. Iconic British luxury brand Burberry gave 16 year old Brooklyn Beckham the opportunity to shoot their “This is Brit” fragrance ad in February. The appointment had a bit of backlash, including insinuations it was due to his parent’s influence, however Burberry CEO Christopher Bailey suggested it was more to do with his huge online following. International fashion model Kendall Jenner also has millions of social media followers, adding to her appeal as a model for major luxury brands including Calvin Klein, Fendi and Estee Lauder. Founder of digital marketing agency Vokent Domenic Venneri says, “We won’t do a photoshoot that goes on a billboard somewhere unless everyone involved has some sort of following and some sort of leverage”, meaning not just the models but everyone backstage contributes to the online impact. A well known collaboration concept is mass market or high street brands collaborating with luxury fashion designers. H&M collaborations are an example of this – introducing a fresh collaboration each year. In the past they have worked with Karl Lagerfeld, Alexander Wang, Lanvin, Versace, Balmain and just this month they launched their latest collection with Kenzo (you can see the new H&M x Kenzo collection here.) The collections have proven successful, creating hype through both brand’s networks that builds up to the release of designs that are more accessible to the common consumer. The buildup for the latest collection has the internet in a frenzy – before the garments are even in stores, people are listing presales on ebay at much higher than RRP prices of course. H&M took the collaboration further still by incorporating influencers and creatives in the campaign shoot. 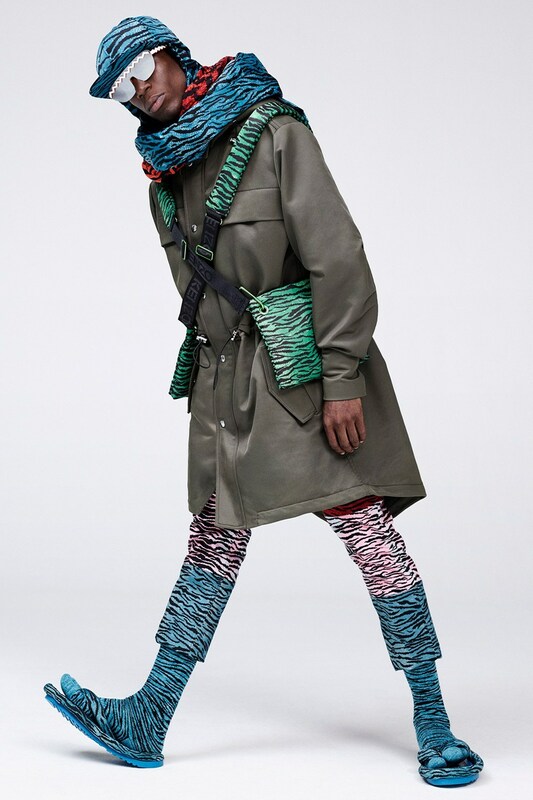 The models for the campaign images include New York student and activist Amy Sall, Juliana Huxtable who is an artist, poet and DJ, London make up artist Isamaya Ffrench and French musician Oko Ebombo. Similar to H&M’s collaborations with influential fashion designers, IKEA is another high street brand associating with select fashion designers to create collaborative mini-collections, alongside their usual offerings. Announced this year, the first fashion designers to release collections with the cult homeware brand are Katie Eary in April, Walter Van Beirendonck in June and Martin Bergstrom in September. The three designers have moved from their core industry of fashion design to create bedding, stationary, furniture and décor, all with very different aesthetics. Similarly to H&M’s collaborations, these collections are an innovative way to cross-market and create the paradox that is an “exclusive” product for the masses. Another fashion industry collaboration comes from celebrities working together with brands, elevating the luxury status of the products. Brand ambassadors are a common way to do this with celebrities signing up to be the face of a brand for a period of time. Belstaff’s brand ambassador and creative contributor Liv Tyler, has recently collaborated with the brand to create a mini collection of 12 pieces. The collection draws inspiration from pioneer Amelia Earhart (whom Tyler and Belstaff made a short film about called Falling Up), the Belstaff woman and Tyler’s real life role of being mother to three children. Brand Ambassadors like Liv Tyler for Belstaff are a personable representation of a brand’s ethos and lifestyle and can be a very important marketing tool for luxury brands. The current age of sharing has made collaboration an important tool for businesses working within the fashion industry. The cross-over of marketing and resources can be mutually beneficial for both parties involved by the exposure of each other’s networks. In addition, the designer-brand collaboration can create uniqueness and innovation by working together to develop new products that the market has not yet seen. In the past year Perino by Woolyarns has worked with different designers for various collaborations. 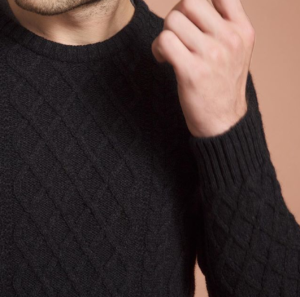 An example of this is Barkers men’s clothing x Woolyarns collaboration where New Zealand Made Perino by Woolyarns yarns were used to create an exclusive collection of high quality knitwear. Sean Kelly’s capsule collection is another collaboration that was specifically created for the Perino by Woolyarns trade stand at Pitti Filati in Florence earlier this year. His soft and luxurious designs showed the unique qualities of Nimbus, a premium blend using fine merino, brushtail possum down and mulberry silk. Finally and more recently, Rory Longdon created a beautiful garment made in Italy for SpinExpo. The dress was on display in the SpinExplore area of the trade show, showcasing innovative knitting techniques. Making connections with other professionals and working in innovative ways together can lead to exciting synergies that were unimaginable before. Frans Johansson’s Ted Talk is a great introduction to the idea of connecting bussinesses to create innovations. The Perino by Woolyarn’s blog covers some great topics relating to the luxury fashion and textile industries. Browse through the posts here or get in touch to learn more about luxury brushtail possum blended yarn here. Ugg Men has just annuonced a ’17 collection of the iconic footwear in collaboration with American designer Philip Lim 3.1. Adidas Originals and Alexander Wang has just released a collaboration that merges the two brand’s aesthetics. The 84 piece collection ranges from US$80-450 and will be in Adidas stores as well as Alexander Wang boutiques worldwide.